There are numerous references to both a shofar and a trumpet being sounded in heaven above as a reflection for sounding the shofar or the trumpet here in the world below. Is there a jazz band in heaven? Do Klezmer musicians entertain dancing angels? Who does God think he is anyway, Elvis? In Numbers 29:1 we are commanded that the first day of the seventh month shall be a day of teruah, generally interpreted as a day of “blowing the horn”. While the word teruah is generally understood as a reference to the sounding of the shofar, teruah is, in fact, not explicitly “blowing the horn” in every scriptural reference. Teruah can also refer to a sound made by a human. For example, in Leviticus 23:23, zichron teruah — a memorial of loud sounds or cries — does not not specifically indicate that the loud sounds or cries are of the shofar, the keren (horn) or the hazuzrah (trumpet). Similarly, outside the city of Jericho, Joshua commands the people to shout, and “v’yiryu ha’am truah gedolah” — “so the people shouted with a great shout” [Joshua 6:20], not referring to the use of the shofar or the trumpet at all. 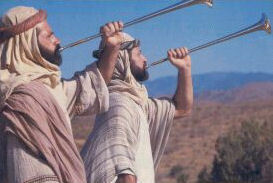 The tekia (sounding) of the shofar, preceded the “great shout” of Am Yisrael: “So the people shouted when the priests came with the shofars and it came to pass, when the people heard the sound of the horn, the people shouted with a great shout, and the wall fell down flat.” This seems to indicate that the sound of the shofar, the tekiah of the shofar (in addition to the command of Joshua), is in fact the inspiration for the “great shout”. While the word teruah refers to the sound expelled from the throats of the people of Israel, and not the sound of the shofars, the instruments are essential in this process. While it is clear that the teruah is not restricted to sound produced on a musical instrument, it is, however, generally an alarm or a warning, and not merely a loud noise. In Numbers 31:6, the word teruah is used in reference to the sounding of the hazuzroth (trumpets): “l’tzevah u’clee hakodesh v’hazuzroth ha-teruah b’yado” — “to the war, with the holy vessels and the trumpets for the alarm in his hand.” Therefore, the teruah is a type of sound that can be produced with the shofar, the hazuzrah or the human voice, and it is an alarm or a cry. In Numbers 10:2 we are commanded to make two trumpets of silver. They are to be blown by the Cohanim for gathering various parts of the people, for setting forward or for being remembered by God in times of trouble and saved from the enemy in the land. That a teruah (alarm) is sometimes the designated sound to be produced by the tekia (blowing) on the trumpets indicates that signaling was effected by a range of blasts. 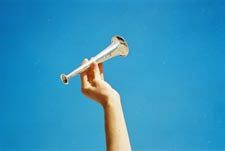 In Second Kings 11:14 it is written, “v’col am ha’aretz sameach v’tokea b’hazuzroth” — “and all the people of the land rejoiced and sounded trumpets.” How does one sound a trumpet? “Tokea b’hazuzroth, titku b’shofar” — “blow the trumpet, blow the shofar.” The type of sound is variable. That the blowing can result in the type of sound which is called a teruah is sufficient but not exclusive. We find that the shofar is sometimes referred to as shofar teruah — “horn of alarm”. Sometimes it is referred to as shofar yovel — horn of the Jubilee (redemption) year. The verb for the sounding the shofar in these cases is “tokea”. Compare this with “teaviru shofar” as in Leviticus 25:9 — “proclaim with the horn”, the horn in this case being the shofar. Distinct from sounding the shofar or hazuzrah for war, alarm or signaling using the action of tokea (blow, sound) or teaviru (proclaim), there is another use of the hazuzrah mentioned in Second Chronicles 5:12-14 that shows that the shofar and trumpet also had musical function: “… And it came to pass when all at once the trumpeters and the singers sounded a note in unison, in praise and thanksgiving to the Lord; and when they lifted up their voice with the trumpets, cymbals and instruments of music, and praised the Lord, saying, ‘For He is good; for His steadfast love endures forever’, that the house, the house of the Lord, was filled with a cloud, so that the priests could not stand to minister by reason of the cloud, for the glory of the Lord had filled the house of God.” “Vayehi k’echad lamchazrim u’lamshirarim” — and it was the same for the trumpeters and the singers. The unity of the musicians, singers and all those present, praising the Lord in the holy place, brought about a manifestation of the Divine presence. Likewise, outside the walls of Jericho, it was the tekia of the trumpets, then the teruah of Am Yisrael, that caused the walls to fall down, a unity of action. 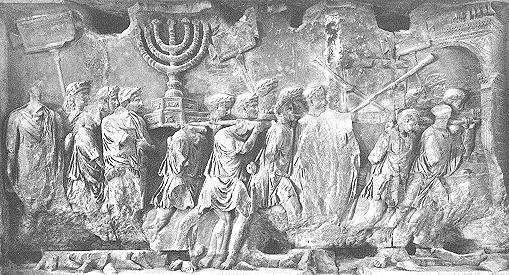 Detail of the Arch of Titus (Rome), showing the treasures of the Second Temple, including silver trumpets, after the Romans sacked Jerusalem in 70 C.E. So, what is a trumpet anyway? Most scholars believe that a hazuzrah means a trumpet. if indeed it does, how do we know what trumpets looked like? There are two ancient sources which give us visual information regarding the size and the shape of ancient trumpets. The Arch of Titus, in Rome, erected to the glory of the Emperor Titus after the destruction of the Temple in Jerusalem, shows the sacred silver trumpets together with the sacred vessels of the sanctuary which Titus carried as booty in his triumphant procession. The second source is a coin of Bar Kochba, issued during the War of Liberation against the Emperor Hadrian, 132-135 CE, which shows a pair of instruments which could be trumpets, though by their proportions, they could just as easily be the double oboe known as aulos. In the Talmud Yerushalmi, Yoma VI:1 (43b), the two sacred trumpets used at various occasions had exactly the same dimensions. Later renditions of trumpets in various manuscripts are often based on the fashion of the day or imagination. There are two families of trumpets most widely in use today. The principle difference is the shape of the “bore”, which is the tube of the instrument. Some trumpets have a straight cylindrical bore which runs the length of the instrument before flaring out at the end into a bell. The other style of trumpet commonly in use today has a conical shaped bore, gradually increasing in size from the mouthpiece until flaring out at the end into the bell of the instrument. Most natural animal horns used as musical instruments are conical in shape. The rate of increase in the bore size varies between the species of animal used. One could postulate that the technology of the time would have restricted the craftsmen. However, silver, being malleable, can easily be bent around a form that is either a straight rod or slightly conical. The mouthpiece at the end of the trumpet can be cupped to enable efficient sound production by lips, or it can be left as a simple round opening at the end of the tube. Therefore, trumpets of that day were quite possibly both cylindrical and conical in shape. There is a greater possibility of reaching higher harmonics on a short conical bore trumpet than on a short cylindrical bore trumpet. In tractate Rosh Hashanah 32b of the Babylonian Talmud, it is stated that, “… children need not be stopped from blowing on the shofar; on the contrary they may be helped until they learn how to blow the shofar.” The gemarah on this mishnah elucidates that, “… neither children nor women need be stopped from blowing the shofar on the festival.” Similarly, R. Jose and R. Shimon state that although women are not commanded to blow the shofar, women have the option of doing so, and therefore they may practice, even on the Shabbath. Let this passage encourage all people, regardless of age, gender or religion, to practice shofar, trumpet and the other musical instruments so as to enable us to collectively praise God. There are those in the Jewish nation whose natural inclination is to sound the alarm on the shofar. Some prefer to call together, with the silver trumpets, those among our people who are spread to the ends of the world. There are Jews eager to blow shofar and trumpet to urge the Jewish nation to go forward. It is magnificent to hear the sound of musicians and singers praising and thanking God together and it is encouraging to witness the young practicing in order to, one day, have their opportunity to participate. As God seems to have demonstrated in the past, in the house that King Solomon built for Him in Jerusalem, united action by all the members of Israel, having feasted and rejoiced on the festival of Sukkoth, may bring us the great privilege of experiencing the revelation of the Divine presence. Psalm sung during sacrificial offering — At the break in the singing or at the pouring out of the drink offering, two priests sounded trumpets and the people prostrated. Water libation — Water from the Silwan, together with a libation of wine, was poured out as a drink offering on the altar. During this ceremony, the priests sounded the trumpets, whereupon the music started and the Levites sang hallel. 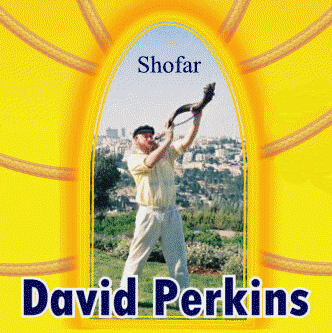 David Perkins blows the shofar overlooking the Temple Mount in Jerusalem. David Lloyd Perkins is an internationally renowned musician and instrument maker specializing in the Biblical trumpet and shofar. He has represented the State of Israel on the shofar both abroad and in Israel. You may visit his website at www.partymusicshows.com. Log in | Register |	84 queries. 0.853 seconds.